Working late this year, oh well, back to the elf factory. Probably a ferocious no-ended Flesh & Bone conclusion to the Christmas period coming tomorrow. Currently listening to (in my head) : Prefab Sprout "The King of Rock 'n' Roll"
LOOK MA, NO PENS! Don't think it's obvious but technology failed me and saved me and for reasons unknown I had to craft this episode of Flesh & Bone on the computer. We'll see if normal service is resumed tomorrow but I have a feeling it might not be. Flesh and Bone 2.0! Currently listening to : DMX "Party Up"
Christmas telly gone down hill. Currently listening to : Waiters "Tomorrowland"
Buy their new split slevin inch with Nissenenenenenenenenenenenenmondai up in herre! Video directed by your main man Nick Ainsworth, his youtube channel is to die for! Currently listening to : Tom Petty "Don't do me like that"
SQUEAKY WHO? It's all about Nervous Olive, baby! Currently listening to : Charlie Sheen "Winning"
Labels: flesh and bone, Nervous Olive, Squeaky who? What's your Christmas face? We've all got one! And now here's today's, we back on track! Check out yesterday's strip below this post. Currently listening to :Elliott Smith "Stupidity Tries"
Currently listening to : Judee Sill "Jesus was a Crossmaker"
Tune in tomorrow to find out what Flesh & Bone are getting their mums for Christmas! Currently listening to : Neil Young & Pearl Jam "I am the Ocean"
F 'n' B is back after a little hiatus there. 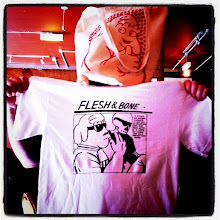 Al desko marks the start of an ambitious plan to post a new Flesh & Bone every day running up until Christmas. There will be a festive theme. Currently listening to : Irma Vep "Be a Mother"